Is the dancer rotating: Clockwise? Or counterclockwise? If you answered Counter Clockwise, you’re also right … but you are LEFT brained. So, what is the difference between Right and Left Brain you ask? If you have ever wondered if you are right brained or left brained … then you will want to read this article to understand yourself a little better and as a result, maybe do a better balancing act between the two sides. Judging from my complete lack of any of the above qualities, I’m wondering if I had a lobotomy of the left side of my brain at birth. Thankfully, portions of the right side are still in tack but as you’ll note, I’m living in a fantasy land. 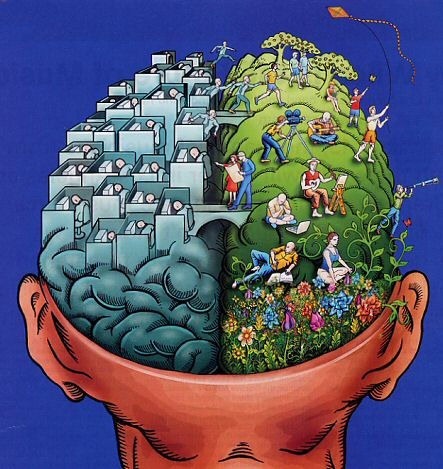 Of course, each of us always use BOTH sides of our brain. But Most people tend to favor one side over the other. The part of your brain that you favor makes you very good at some things, but it can also work to your detriment. Left-Brained people may be very good at analyzing things, but may have a harder time taking risks because they have a need to play it safe or base their decision on JUST reason or logic. Right-Brained people may be very good at coming up with ideas or using their imagination and being creative … those they may lack the skills needed to stay organized or keep their finances balanced. You’ve come this far in your life through this over reliance on one side of your brain over another … but just imagine what you could accomplish if you could bring both sides of your brain into more of a balance. Many people can change the dominant way of their thinking by doing more things that require you to think in that way. Or maybe you can get some hypnosis. Now, take a look at the picture again! See if you CAN make the picture switch and go the other way. I tried for a least 20 minutes and I’m convinced she can only turn clockwise!! I don’t see how you could see it any other way. The easier time you have with it, the easier you will be able to go into hypnosis and make this change in your brain. I’m destined to live out my life in an imaginary world where practicality has no place at all. If you can change your mind, it’s not just a mental change that will happen, but literally physical grooves inside your brain will begin to rewire themselves to cause you to automatically have the ability to shift your way of thinking between right and left whenever you need to. I’m skeptical. My brain transmitters have been sending signasl one way for 65 years. I don’t see them taking a new route anytime soon. This entry was posted in Health and well-being and tagged How to change your mind, Playing the brain game, Right vs left brain by Emily Jones. Bookmark the permalink. Emily, my younger daughter who is visiting from KC and I both watched the dancer and both immediately saw her moving clockwise and then counterclockwise. Fascinating. Interesting read. Know a good hypnotist? Emily, she goes both ways. I agree with Conley, both ways. Obviously ya’ll are better brain balanced than I. I stared at her for 10 minutes and for the life of me can’t see her going counter clockwise!